Squash House Quilts: Quick as a Squirrel Finish! I recently got another Sweet Stitches Block of the Month in the mail. This one is called Little Acorns. I don't think I had it in the house for more than 10 days or so and have already finished it! Now that's my kind of BOM! I love anything to do with squirrels and this once is definitely a cutie! Many of you have asked about the colorful bits in amongst the stitching. These are little iron on appliques that are included with each month. They are prints of original watercolors by Kathy Schmitz. You can still order these HERE. I get mine from Shabby Fabrics, but I don't think they offer them any longer. Soon we'll be seeing squirrels picking up acorns all over town. I love finding and picking up whole acorns on my walks around town. Until we got Gracie May, I kept them in a little vintage wooden bowl on the counter. One day I found Gracie May chasing something very small around on the floor. Turns out she had raided the bowl of acorns and they were all over the house! Silly kitten. She keeps us on our toes, but between her and Sasha they provide us hours of entertainment and love! Oh goodness that's adorable. I can just see Gracie Mae batting the acorn "toys" around the house! :o) Acorns were raining on Abby and I on our morning walk. The squirrel critters were up in the tree eating. I must be bad, bad.. I keep the squirrels out of my yard. 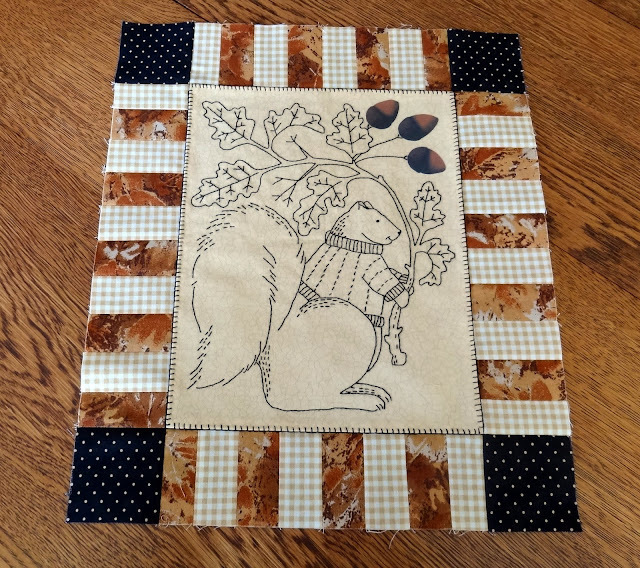 I like my squirrels in thread.. very cute! Adorable block Candace. Your stitches are perfect...I love the blanket stitch around the inner block. Who doesn't love a pieced border?!?! This is gorgeous! You did such a fabulous job! you are a speedy stitcher! 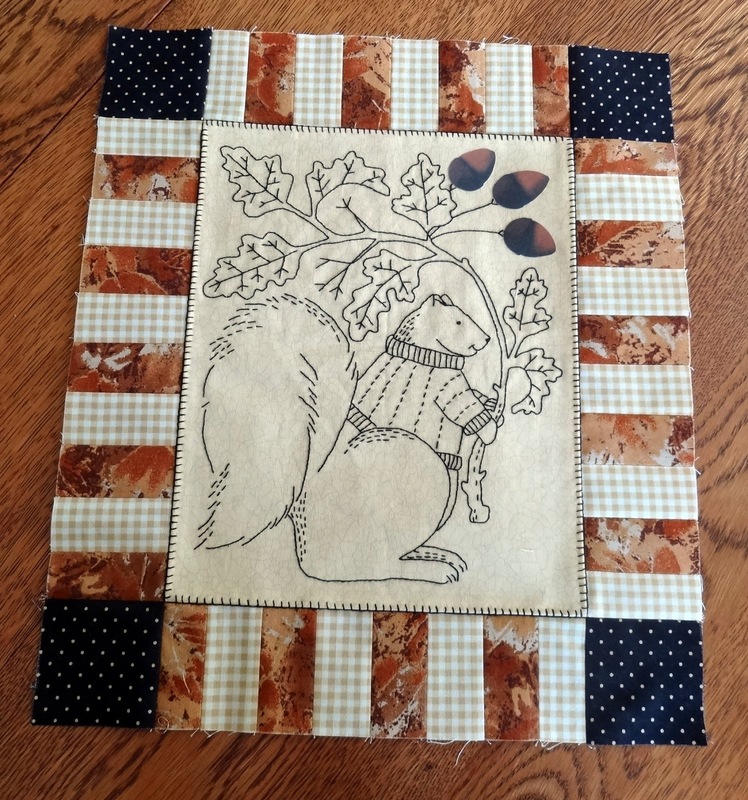 This one is cute, and the border fabrics are perfect for the Autumn feeling of the picture. I love it. 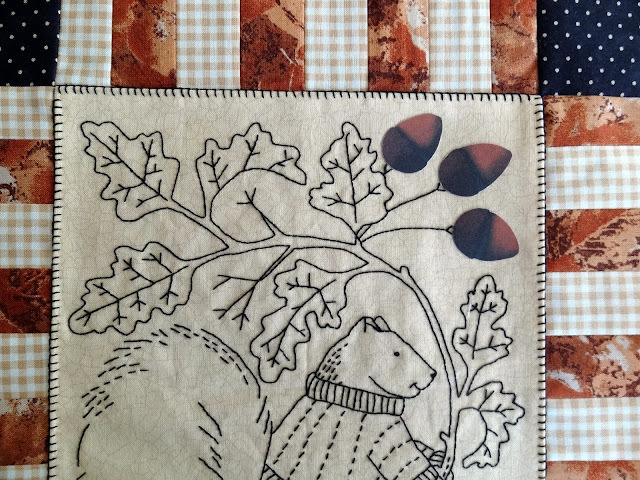 The colours of the borders are wonderfully re-squirrely too, did they come with the stitchery, or is that your addition? Your stitchery is adorable! The patchwork frames it beautifully! Tons of fun for Gracie May to have found that bowl of acorns! Naughty kitten!